MOOREHEAD, IN CHARGE OF EXPLORATIONS. American field from the mouth of the St. Lawrence to Mexico. times than does the celt." 166 Ohio Arch. and His. Society Publications. tion of each section visited. the trip down the Muskingum from its source to McConnelsville. Stone Mound of the Reservoir. along the Ohio. Mr. Cowen was with our party two weeks. Mr. F. E. Bingman, Jackson. Mr. T. M. Bright, Chagrin Falls. Mr. W. S. Bradshaw, Hanging Rock. Mr. G. F.Bareis, Canal Winchester. Mr. J. W. Barger, Waverly. Mr. R. L. Condon, Omega. Mr. J. C. Corwin, Waverly. Mr. J. V. Farver, Millersport. Mr. A. C. Francisco, Akron. Mr. W. C. Hampton, Mt. Victory. Mr. R. E. Hills, Delaware. Mr. J. H. Johnson, South Portsmouth, Ky.
Mr. E. H. Moore, Athens. Mr. G. F. Manning, Coshocton. Dr. A. J. Marks, Toledo. 168 Ohio Arch. and His. Society Publications. Mr. C. C. Naylor, Manchester. Mr. J. R. Nissley, Ada. Mr. E. S. Perkins, Weymouth. Mr. J. M. Richardson, Wilmington. Mr. C. C. Stamin, Mifflin. Mr. L. D. Sprague, McConnelsville. Mr. J. W. Tweed, Ripley. Mr. F. E. Williams, Wauseon. our notice. I acknowledge my obligations to them:-Mr. H. B.
Cullough, Youngsville; Mr. Arrick, McConnelsville; Dr. W. H.
Higby's Station; Messrs. Harness, Richmondale; Mr. W. H.
Columbus, O., Dec. 1st, 1896. County is drained by Jonathan Creek, a tributary of the former. its branches we did no work in the southern part of the County. pied by an ancient lake. 170 Ohio Arch. and His. Society Publications. present day it is upon the farm of Mr. Owen Brown. place a bulk of material 15 by 25 feet. (Figure 1). and continued for five days with an average force of nine men. a few stones occurred. 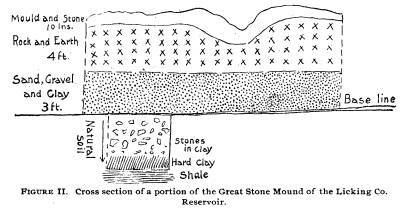 The clay showed the "dumps" plainly. exhibits such a part of the mound. than 12 or 15 feet high,-while the average is less than 6 feet. 172 Ohio Arch. and His. Society Publications. Columbian times, of a stone mound 50 or 55 feet in altitude. ant teamsters done their work of demolition. burnt stone and one arrow-head. 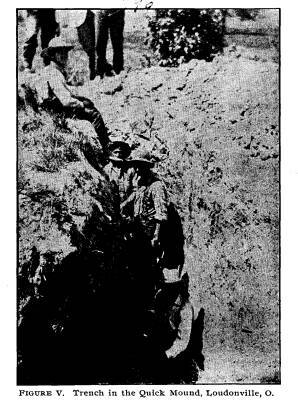 ing them, carrying away from 10,000 to 15,000 wagon loads. * Cincinnati, 1885, page 42.
no other relics of any note." 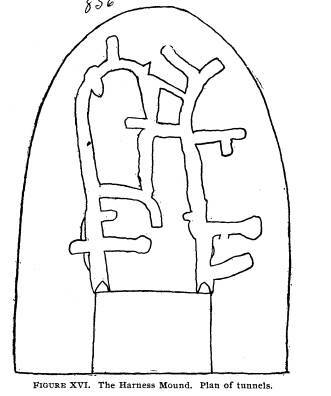 bracelets, they have proven that the "Holy Stone of Newark"
discovery. He knows nothing personally of the "Holy Stone,"
* G. P. Putnam's Sons, New York, 1892, page IV, preface. 174 Ohio Arch. and His. Society Publications. ark,' which, as is above shown, was simply a counterfeit." dred-foot tape, was 652 feet around, 31 feet wide and 4 feet high. head of the bird was 28 feet from the center of the circle bank. bottom. We excavated in the bird effigy, finding ashes. eight remains in Perry county. 176 Ohio Arch. and His. Society Publications. stances to prove that trade relations existed. of this material and yet the supply does not seem to be exhausted. SECTION 2. THE MUSKINGUM VALLEY PROPER. * American Antiquarian Society, Worcester, Mass., 1820, page 132. Ashland County, also through the edges of Holmes and Knox. earlier and more primitive one. MIFFLIN, ASHLAND COUNTY, BLACK CREEK VALLEY. we found a hematite celt and a flint knife. 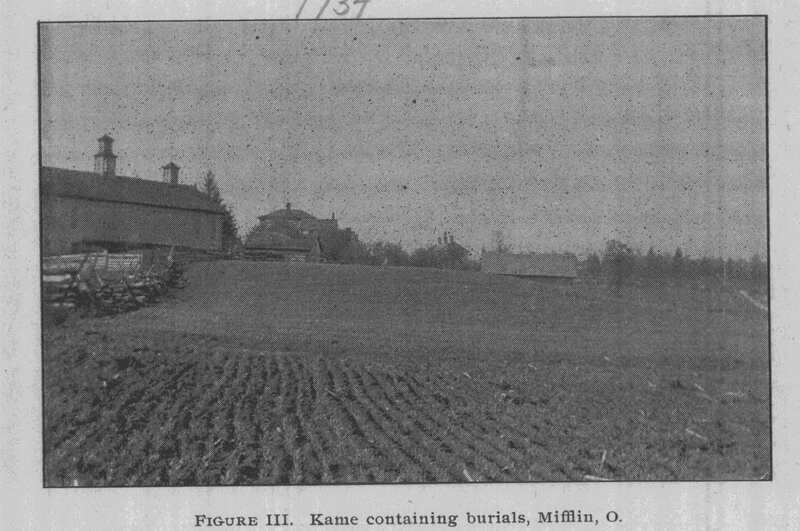 Figure III shows Mr.
Stamin's kame and barn on the site of the skeleton finds. 178 Ohio Arch. and His. Society Publications. valley, we purchased specimens of farmers. two mounds. Both had been examined. We began work the morning of the 8th on the Quick farm. in Figure IV. It had been partly dug some sixty years ago. joining fields, but more in the valley below, along the stream. side, was nine feet on the east and south sides. above this. It seems to have extended over a space 12x15 feet. of white earth eight inches thick above the hard floor. there were indications of burials, ashes, pottery, etc. ever, a large piece of skull and some of the leg bones were secured. 180 Ohio Arch. and His. Society Publications. them were some small pebbles of irregular shape. tained that all of them had been excavated. present his report in full. goes by the name of Bryte's Fort. stone cist, upon which was almost a peck of red Indian paint. and scarcely a trace of it remained in 1878. 182 Ohio Arch. and His. Society Publications. Wolf Indian, ruled the village until he left it in 1812.
region annually until about 1812, for the purpose of hunting. five or thirty feet in diameter and four feet in height. half a mile from the spring to the mound on the hill. elevation of gravel drift. Excavations might change this view. are reported to have crumbled away on being exposed to the air. who made the excavation are dead. In draining this pond a cache of flint implements was discovered. 184 Ohio Arch. and His. Society Publications. 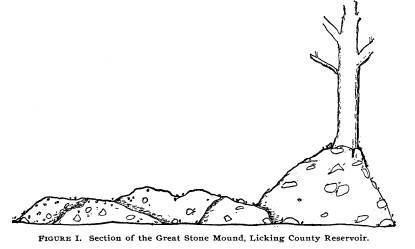 author has not visited the mounds. northeast of Loudonville, just east of the Holmes County line. bone of a deer, had been perforated, evidently with a stone drill. implement, and charcoal are in the author's cabinet. also commands a fine view of the Black Fork valley. 186 Ohio Arch. and His. Society Publications. eminence a view of the valley of Honey Creek might be had. may have been timberless during the occupation of this work. The excavation appears to have been about 15 feet in diameter. and earth mound such as are usually found on high points. bowlders as large as a man can lift. burnt earth were fragments of arrow-heads broken by the heat. inets of the above named gentlemen. a pipe, human remains, and some other relics. of the stonework, which consisted of a paved circular space. 188 Ohio Arch. and His. Society Publications. and the site plowed over. side of the stream about 4 miles from the Ashland County line. further examination might prove interesting." on both sides, upon the high hills. was nothing found in it. Mr. Gann lives opposite the Hunters, across the Mohican. arrow-heads lay about a foot from the surface near the center. 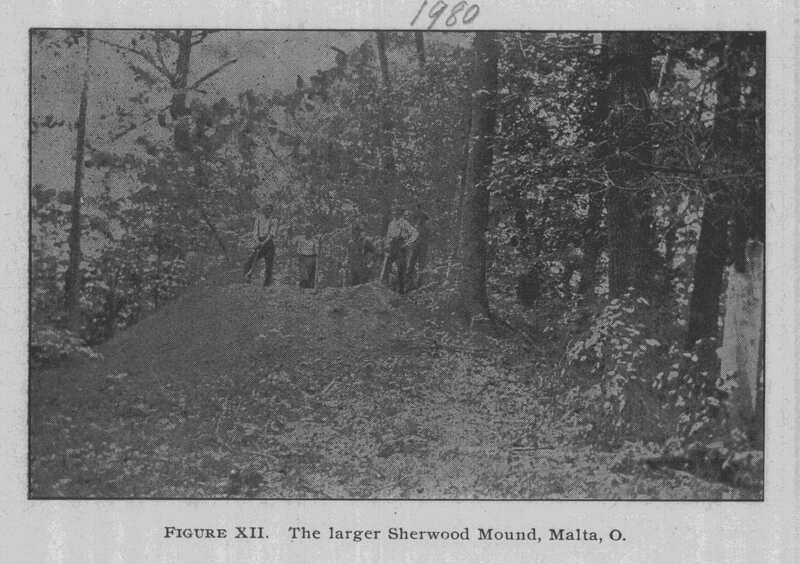 The small mound contained charcoal and burnt earth. 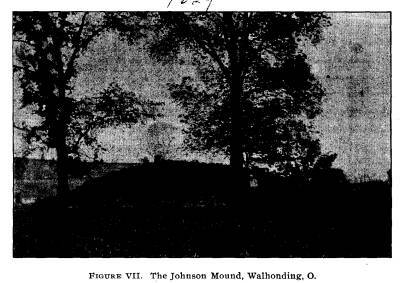 We reached Walhonding late in the evening of the 12th. cache. The others yet lie in his yard. did not attempt to dig in it. but nothing was found, except two small arrow-heads. 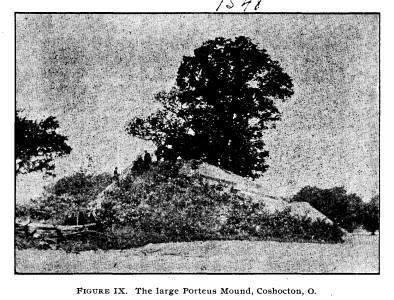 It is singular that the Muskingum mounds contain so little. 190 Ohio Arch. and His. Society Publications. by the workmen who exhumed it. report having made any discovery. and charcoal on the base. for its lack of contents. See Figure VII. * See also Figure XXIV, page 238. 192 Ohio Arch. and His. Society Publications. covery as one of interest to the archaeological world. vogue and a description is therefore unnecessary. central part of Jefferson Township. played a part in the history of the upper Muskingum. of the interesting tumuli. Of the large mound little need be said. ing a trench thirty-five feet wide and seventy feet long. and there were no soft places, the entire mass being hard packed. 194 Ohio Arch. and His. Society Publications. tons headed in a common direction. high. We think the enclosure merits future investigation. five feet high and sixty feet in diameter on the land of Mr. M. C.
196 Ohio Arch. and His. Society Publications. in halves at the hips and destroying all of another save the skull. knife or cutting tool, some arrow-heads, pottery, etc., were found. "Skeleton B" is the most remarkable one in the mound. removed from the frontal bone on the crown of the head. Institution and await the opinion of experts in craniometry. and its importance to our native Ohioans. broken, but yet in such fragments as will permit restoration. pointed instrument. 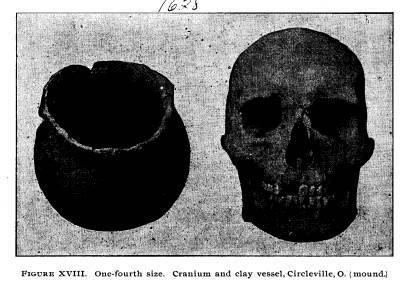 The cranium was preserved nearly entire. 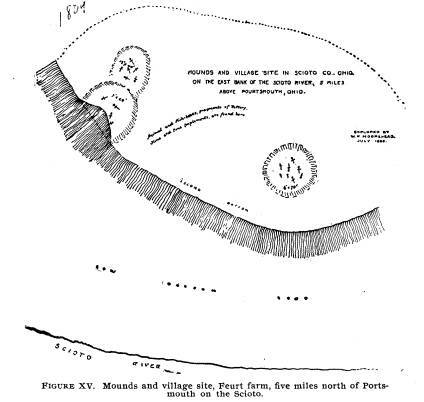 many mounds and secured permission to excavate in several. thirty feet intervened between the two mounds. 198 Ohio Arch. and His. Society Publications. site of some acres in extent upon the terrace below the mounds. stored the structure to its original form. extended a total of 100 feet. cayed skeleton. There was nothing else in the mound. under special obligations to him for his kindness. ended the work in this region. 200 Ohio Arch. and His. Society Publications. ington County, who is better posted than any one else. surveyed and that they are in Morgan County near the river. Possibly he refers to those near McConnelsville. about one-tenth of the number. ments, of course Licking and Washington Counties stand first. * Bureau of Ethnology. Report for 1882-'83, page 22.
did not reside here during any great length of time. in and enclose their fields, etc. * Bureau of Ethnology. Report for 1890-'91, pages 458-472. Society, Worcester, Mass., 1820, by Caleb Atwater, page 129. 202 Ohio Arch. and His. Society Publications. among persons of archaeologic tendencies, we will quote. or other vessels, by steps formed in the sides of the well. ments of the Mississippi Valley. been found in and near to the ancient works at various times. a cup with low sides. triangle with two long sides." to discussions upon the "purpose, use, etc." of the enclosures. have done archaeologic science an immeasurable service. 204 Ohio Arch. and His. Society Publications. water was undoubtedly not aware of it at the time. than from the substance of a letter written by Mr. Williard H.
Davis on December 14, 1891. "One mile and a half from Marietta, upon the farm of Mr.
the farms of Messrs. Wilkings, Snyder, etc. ing else in the structure, except a badly decayed skeleton. of observation than for the interment of the dead. * Primitive Man in Ohio, page 21.
and human bones, were found scattered among the stones. race on the Davis estate, Wilkings, Snyder and other farms. ravine, on the west side of which once existed a small mound. to indicate the presence of a village. bankment near the same spot. The circle has an inside ditch. impression of a twisted bark basket. 206 Ohio Arch. and His. Society Publications. no effigy of this kind has ever been found in the State of Ohio. or two stone graves are also to be found upon this property. small and one or two layers of sandstone slabs were observed. was separated from the rest of the body by a distance of a foot. structed from the shell of a land tortoise, were with the head. 100 feet. North of the enclosure is a small mound which Mr.
per, and a tube of clay and sand. in it there were no remains. tite in a tumulus upon the same terrace as the altar mound. were 6 or 7 inches in length and beautifully worked. *He means in the Lower Muskingum. 208 Ohio Arch. and His. Society Publications. in diameter with a central perforation. In a mound upon Mr.
in a kneeling position with a child's skeleton in her arms. the same place. (This is not far from Lowell). pared with those in the Scioto and Miami valleys." northern part of Clear Creek Township, Fairfield County, Ohio. place was probably resorted to by local tribes. secured permission for us to excavate. miles north from Youngsville upon the farm of Jane McCullough. fourteen by eight feet and two feet high. 210 Ohio Arch. and His. Society Publications. Brush Creek Valley stone mounds. bones were in natural positions. the north side of Brush Creek, opposite the one just described. were purchased and field searching done over village sites. twenty-five acres and must have contained at least 200 lodges. In the afternoon we opened two stone graves upon Mr.
served and part of one cranium. mands a view of the surrounding country for ten miles. coal two inches in thickness was observed. head. 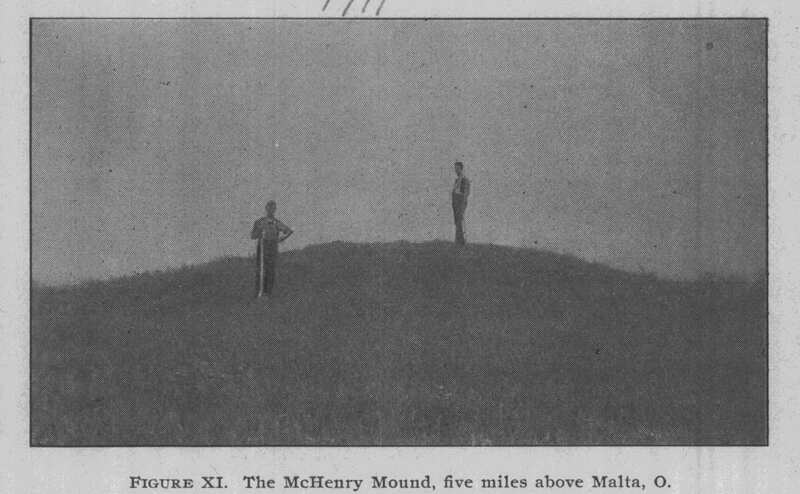 The mound was four feet high and forty feet in diameter. 212 Ohio Arch. and His. Society Publications. layer of burnt earth ran along the base under both the remains. they were originally intended to accompany the remains. erated), third circle 150 feet in diameter." *J. P. MacLean in Smithsonian Report for 1885, pages 893-899.
in different ages by different people." July 1st.-Mr. Loveberry secured 18 spears from Mr.
and constitute one of the finest deposits ever discovered. Creek for several miles, mapping graves and sites. used solely as hunting grounds. 214 Ohio Arch. and His. Society Publications. mens. Mr. Morrison, of Newport, also donated his collection. we engaged a skiff and set out for the Ohio. SECTION 4. 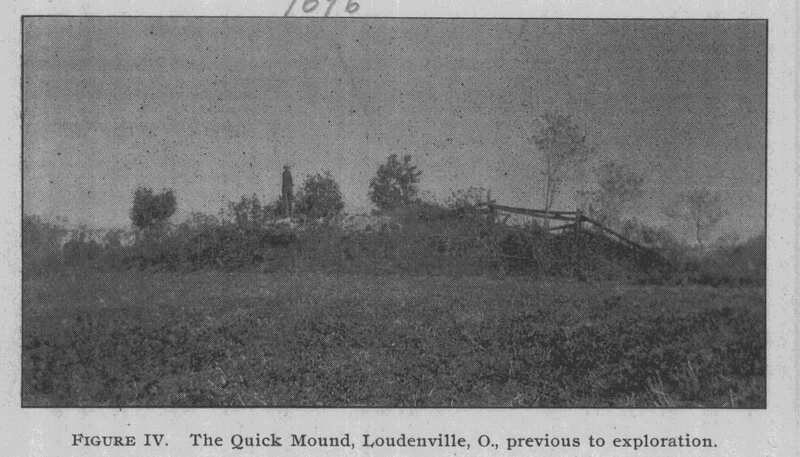 MOUNDS ALONG THE OHIO RIVER. although decayed bones in large quantities occured in all three. tons, some of which appeared to have been buried in part only. favorable spot in two hours. ered into the baskets and dumped upon the structure. 216 Ohio Arch. and His. Society Publications. skulls, as every one was broken, as were most of the long bones. from a battle field, possibly from a charnel house - who can tell? hard fight, being in the end captured. borhood could not be explored. 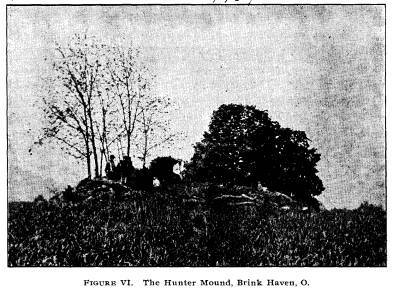 July 11th and 13th.--Three mounds upon the farm of Mr.
mounds must have been house sites instead of burial places. The mounds are all sand and gravel. This is rather unusual. was made. Only the complete skeletons are shown on the diagram. 218 Ohio Arch. and His. Society Publications. down used different clay, different forms, or were another tribe. Future study will determine that. lay in every direction and several were on top of each other. 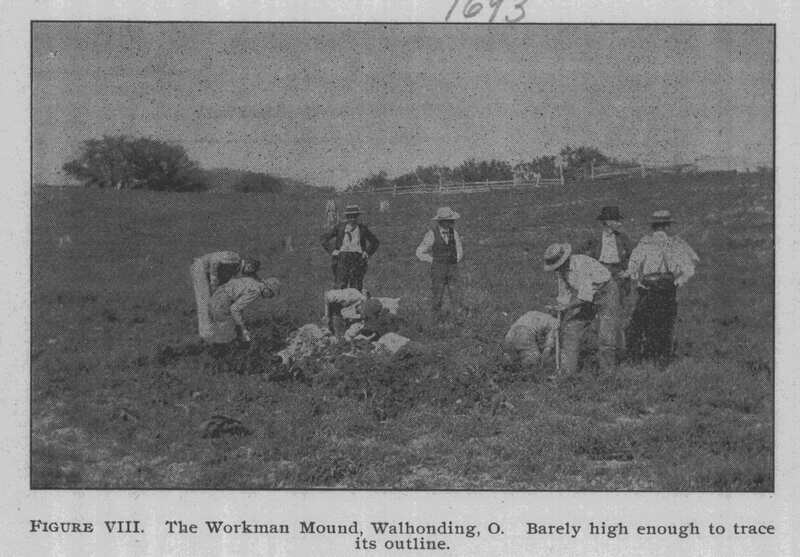 in part to long cultivation lowering the height of the mounds. of the others were stratified. some 15 miles up the Scioto. SECTION 5. ROSS COUNTY TUMULI. one decayed skeleton and a flint disc. ing was found in it though we dug thoroughly. 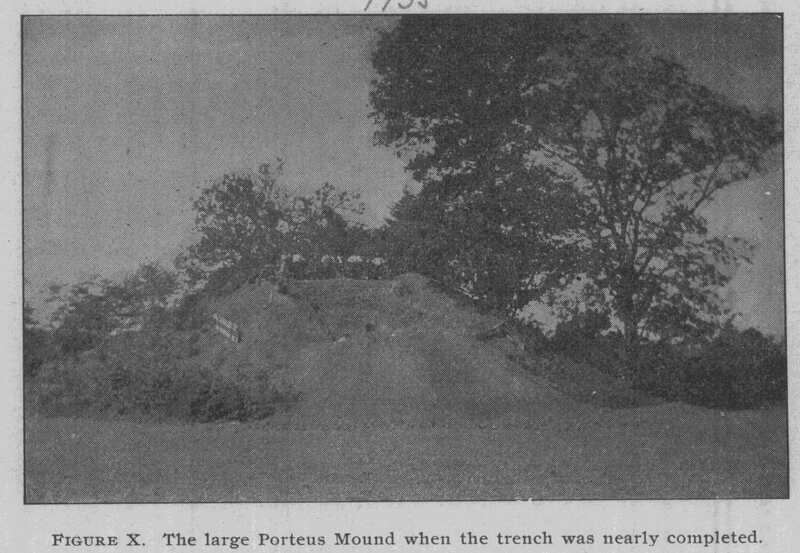 nor Barger's mounds were stratified. in it a cremated skeleton and an arrow-head, but nothing else. 220 Ohio Arch. and His. Society Publications. over seventeen hundred and eight hundred feet, respectively. identity which subsequent comparison has shown to exist. + Ancient Monuments of the Mississippi Valley, page 56.
evenly and with care, or brought from a distance. and other works of the same series be wholly accidental." 222 Ohio Arch. and His. Society Publications. ago. We present his report in full at the end of this section. gray matter, such as results from the decay of wood, was found. 224 Ohio Arch. and His. Society Publications. a child and an adult. All the others were more or less burnt. animals) found just below the surface in the east end. copper plate. Eight of the bodies had objects buried with them. 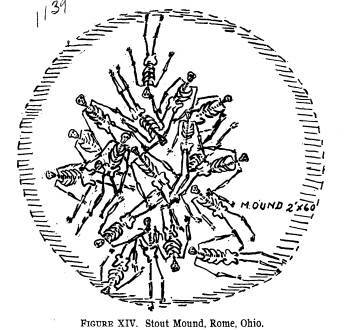 mentsin the mound numbered 27.
observed in the large mounds of the Scioto. 226 Ohio Arch. and His. Society Publications. or uniform to justify or sustain a classification. had been burned to considerable hardness. above described, except that the timbers had been less in size. the mounds of the first class; but the sand strata were absent. ers than it has to the authors of these inquiries." 228 Ohio Arch. and His. Society Publications. PEABODY MUSEUM, VOL. III, NOS. 5 AND 6.
burnt seeds, nuts and acorns, were found in the bed of ashes. and a few burnt bones. vary considerably in their structure. 230 Ohio Arch. and His. Society Publications. of loose stones was placed around its base. mark that the body seemed to have been enveloped in matting. half a dozen pointed implements made from the leg bones of deer. SECTION 6. RELICS OF ANCIENT OHIO TRIBES. 232 Ohio Arch. and His. Society Publications.